This week Talking Movies is going to be taking a look at the critically acclaimed 2008 motion picture The Wrestler. I’ll be poring over two carefully selected scenes from the movie and looking at how they’ve been carefully orchestrated and arranged in order to attack the viewer’s eyeballs and leave them with a visually arresting image. I’ll deconstruct the scenes and explain how you can make use of the techniques and tricks they employ when you’re out on the streets trying to create some great street photography. I will choose two of my own pictures to compare with the movie scenes, and discuss the ways in which my shots compare to those from the movie that have influenced me. For every previous installment of the Talking Movies series you can visit the Talking Movies section of the blog. Helmed by acclaimed director Darren Aronovsky, and starring Micky Rourke, Marisa Tomei and Evan Rachel Wood, The Wrestler charts the travails of an over-the-hill pro wrestler Randy Robinson (Rourke), who has endured a sad fall from grace since the heady days of the 1980s when he enjoyed star billing as celebrity wrestling star “The Ram”. The movie won a brace of Golden Globes as well as a BAFTA award, and was also nominated for double Oscars for both its lead and supporting actors. Cinematography for The Wrestler was deftly handled by French cinematographer Maryse Alberti, winner of both Sundance and Independent Spirit awards, who is best known for her work on documentaries. She was chosen by Aronovsky on the basis of her documentary work, as he sought a “documentary style” look for the movie, an effect which is greatly emphasised by the widespread use of handheld 16mm cameras throughout the production. Scene number one that I’d like to take a look at is a shot that for me perfectly epitomises the premise of the movie. It shows The Ram sitting hunched, dejected and alone inside his trailer. The shot is one that I’d classify as ‘wide’, and is (unsurprisingly) archetypally documentary-like in its style. The camera lens peers voyeuristically through the open door, subtly observing the character’s private reflective moment. The viewer feels as though they are they really witnessing someone at their most vulnerable, and the use of the doorframe serves to further emphasise the character’s loneliness and isolation. This effect is further heightened by the lighting in the scene, which, to state the obvious, is characterised more by the lack of light than anything else! The shot is dominated by great swathes of deep black negative space, an effect which was achieved through the use of a newly introduced 500T film stock whose exposure latitude and dynamic range allowed for immensely subtle details even when heavily underexposed in scenes like this. Observe how just a few light sources are able to lead the viewer’s eye around a scene in a subtle yet powerful way. Soft ‘natural’ moonlight spills in from a window to the left, picking out just a few details in the trailer ahead of the wall in order to lend the scene a little context and to prevent it from being too abstract. The rest of the lighting in the shot is dealt with by lights inside the bedroom seen through the doorway. This creates a narrow strip of light in the centre of the scene that the eye naturally gravitates towards. The weird geometric shape constructed by the doorframe makes for a memorable and unusual composition that lingers in the mind. It has naturally been placed just off the centre of the frame in order to create disruption to the visual weight of the shot, which is a very common trick employed by moviemakers, as I’ve mentioned in a few previous installments of this series. The character is positioned totally perfectly to be just visible, with his hunched body shape conveying his inner turmoil. The lighting on him is arranged perfectly in order to achieve a fully dramatic effect – notice how his body appears only as a silhouette against the brown wall behind him, with just his mane of bleached blonde hair picked out by lights in an almost ethereal way. How to achieve a shot like this in street photography? Look for strong vertical frames you’ll see on the street with a light shining through – a doorframe naturally being the most obvious candidate! Like the cinematographer in The Wrestler, you want to be sure to exposure only for the highlighted area seen through the ‘frame’, and you may even choose to underexpose by a stop or two to lend your shot a really brooding and moody feel. With the right combination of exposure and composition you can really simplify a seemingly busy scene to lend it extra power and impact. My shot is actually far simpler compositionally than the one found in the movie, and my use of negative space is far less subtle. For this shot I’m looking through the crack in two panels that sealed off an alley under construction. The lack of light in the alley and the absence of any artificial light combined with the limits of dynamic range on digital sensors made for the heavy areas of shadow which dominate the photo. Fortunately the interesting triangle made by the panels and drum keeps the shot from looking too staid as a result of the heavy black areas of negative space, though it could be improved by a little more shadow detail as found in the The Wrestler scene. The graffiti on the wall behind the woman and her bug-eye sunglasses add an extra element of interest to her as a character, though her body shape and positioning isn’t nearly as dramatic as Mickey Rourke’s hunched shadowy frame in the movie. The second still I’d like to analyse features another point of view that is typical of the movie, and that is a shot of characters’ backs. Much of the movie is dominated by follow shots of “The Ram’s” hulking back and shoulders, as the camera follows him from scene to scene. This shot is a little wider than others that characterise the movie, but I chose it because of the masterful use of leading lines that really dominate the photo. The director and cinematographer have used the boardwalk decking to great effect, using the lines of the planks of wood on the decking as giant leading lines that draw the viewer’s eye across the frame from right to left converging into a vanishing point style on the right of the frame. Note how the characters actually follow these leading lines as they walk, perfectly fitting with the journey the viewer’s eye takes across the frame. The scene has clearly been very meticulously scouted for use in this shot as the opposing directions of the rows of planks create a very powerful geometric pattern that really livens up what could otherwise be a fairly standard scene. Close attention has been paid to small details in the shot too. For instance, the horizon line that our ‘vanishing point’ converges on is positioned in perfect accordance with the rule of thirds compositional framework for interestingly composed images. The horizon appears almost exactly two thirds of the way up the frame, allowing the decking to dominate the lower two thirds. As I have mentioned in previous Talking Movies posts, the choice of colours in a scene are often chosen with great care and attention to detail, and this scene really is no exception. It is dominated by muted grey brown beige tones that are largely harmonious to one another and so make for a nicely balanced shot. The only colour that really stands out against the mass of brown tones is the flash of turquoise on the pier building on the boardwalk. Colour theory and the colour wheel show that blue hues appear opposite those in the orange/brown spectrum. Turquoise and brown are complementary colours to one another, and so this effect really makes the turquoise pop. To achieve a shot like this in street photography is actually quite simple. For leading lines you can use anything with strong geometric lines running underfoot. Decking or boardwalk would naturally spring to mind, but these can be hard to find, so you can look instead for things like pavements with clear and dramatic patterns, or also lines painted on the tarmac, as you find in car parks. Like the movie shot, my photo is dominated by very strong leading lines that sweep across the frame from left to right, converging in a similar style to those found in the movie. Again, as with the movie, I was lucky enough to find my subject walking in perfect step with the leading lines, and I was even fortunate that the direction of the sun cast his shadow across one of the leading lines too. My photo is shot at a slightly different angle to the movie scene – I’m closer to my subject and at a different angle, which makes my shot feel a little more immersive and immediate compared to the slightly detached ‘over the shoulder’ follow style from the movie. The sky and clouds naturally play a key part in the composition of my photo, whereas the sky serves purely as a backdrop in the movie still. My photo is actually rendered a little too busy by the dramatic skyline – arguably it needed a simpler background like the movie that didn’t threaten to take the viewer’s attention away from the person as the main focal point. 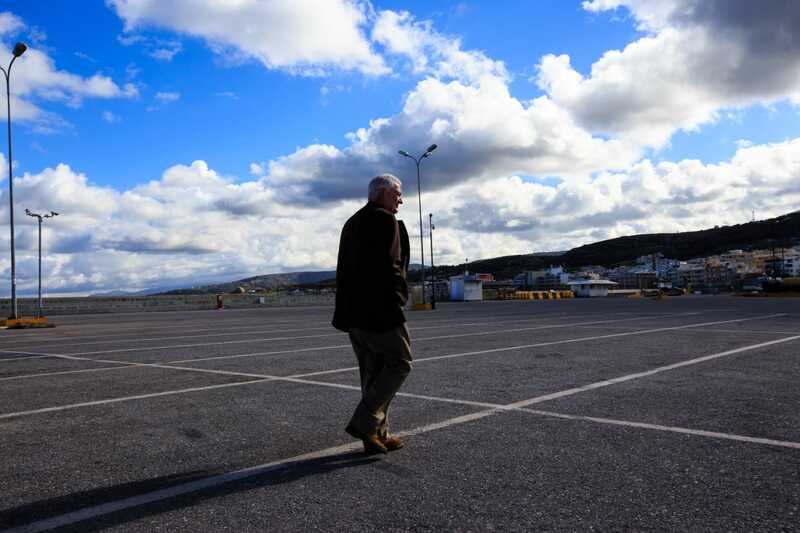 As for colours, again the movie shot is far better balanced here – the strong blue in the sky leaves my shot a little unbalanced against the dull grey of the asphalt, though at least the man’s brown shoes and jacket are complementary colours with the blue in the sky. Hopefully you’ve found this analysis of two scenes from The Wrestler useful, and that by comparing my shots you’ve got some idea of how it’s possible to take some of the visual themes and tricks in this movie and apply them when out on the streets. I absolutely loved The Wrestler when I first watched it – the movie’s visuals just knocked me out, and that’s to say nothing of the performances of the actors, which truly is top drawer. I’ve re-watched The Wrestler several times, and I’m consistently impressed with the immersive way in which the movie draws the viewer in and allows them access into ‘The Ram’s’ melancholic world, which is built entirely on his past glory which is now a distant memory. Documentary style photography really resonates with me, and I feel it has an integral role to play in understanding and improving your street photography, and this movie is one of the best examples of documentary photography I’ve seen in a feature film. So I highly recommend it for you street photographers out there – kick back, relax, and watch it. Then grab that camera and head out! 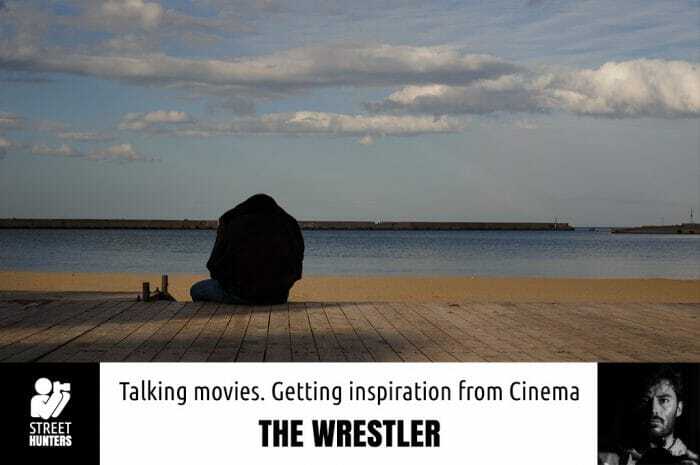 I haven’t watched The Wrestler, but thoroughly enjoyed ths talking Movies review. Will certainly watch the film now.